The ET Foundation and the ET Seminar Committee are pleased to invite abstracts of papers proposed for presentation at the Twelfth International Extrusion Technology Seminar - ET '20, scheduled for May 19-21, 2020, Orlando, Florida, USA. While the primary focus of ET is technical, papers of a practical, operational, or theoretical nature are invited as well. Presenters are encouraged to challenge every facet of the extrusion industry to raise its level of expectations, quality, and performance. Details regarding the selection criteria, reviewing of abstracts, and presentation information are found in the Call for Abstracts brochure. 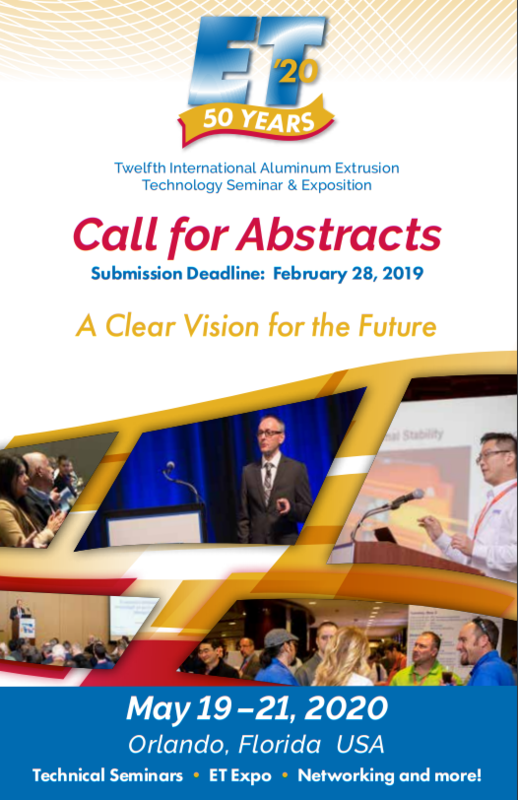 Abstracts of no more than 200 words are invited from practitioners and researchers from in and around the aluminum extrusion industry. Authors may submit multiple abstracts. The 200-word abstract must include sufficient detail to permit a thorough review and evaluation of the paper’s proposed content and significance. Abstracts must be submitted through the ET '20 online content collection portal ONLY. IMPORTANT: This is the only method for submitting abstracts for ET '20. To receive important news and updates regarding the ET Seminar, ET Foundation, and AEC, please sign up on our mailing list here.